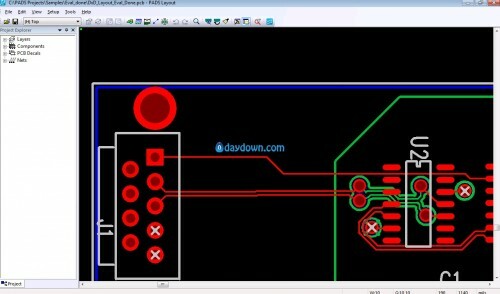 Mentor Graphics, a technology leader in electronic design automation (EDA), has released VX.2 version of PADS Standart Plus is an easy-to-use, complete desktop design flow for PCB hardware engineers and layout designers requiring higher productivity. 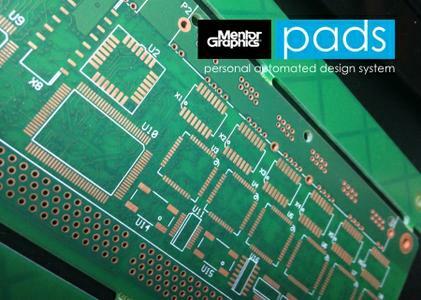 PADS Personal Automated Design Solutions provide an easy-to-use environment that helps solve the PCB design challenges you meet every day. Using PADS, you will get your job done faster and better, while saving costs. Targeted toward the independent engineer who requires a more complete design flow that includes advanced toolsets, PADS Standard Plus is equipped with enhanced layout and integrated analysis and verification, supplying all you need to produce quality PCBs, fast Easy-to-use schematic and layout translators help import libraries and designs from your current toolset, whether it's Allegro, Altium Designer, CADSTAR, OrCAD, P-CAD, or Protel. - PADS HyperLynx DC Drop - Avoid unexpected circuit behavior by identifying power delivery issues early. Validate power supply impedance to optimize power distribution networks. Assess voltage drop by quickly and accurately identifying areas of excessive current density with fast and accurate results. - PADS HyperLynx DRC - A rules based approach versus traditional simulation to identify non-CAD constraints. Out of the box checks for EMI, Signal Integrity and Power Integrity. Simple to set up and fast time to results. Visual and report form of results for easy identification of violations. - PADS HyperLynx DDR - Identify and solve Signal Integrity and timing challenges specific to DDRX designs. Resolve typical SI impairments such as Overshoot/Undershoot and ringing. Identify DDX timing issues such as Setup/Hold, De- rating, Skew and Data bus margins. - PADS FloTHERM XT - 3D computational fluid dynamic (CFD) solution that supports steady state and transient analysis. Allows electrical/hardware engineers to perform thermal analysis much earlier in the design cycle. Easily import mechanical objects such as product enclosures and heat sinks. - PADS AMS Design Suite - Comprehensive circuit design and virtual prototyping environment, including support for analog and mixed signal (AMS) with SPICE based simulation engine and modeling. In addition to standard simulation analysis: DC Bias, time-domain, and frequency-domain simulations, AMS also includes multi-run parametric sweeps, sensitivity, Monte Carlo, and Worst Case analysis. - PADS Multi-Trace HSD Routing - Route and tune nets with high speed design constraints automatically without the need for the Batch auto-router. This release also includes significant core enhancements to xDX Designer, PADS Layout, and PADS Professional. Mentor Graphics PADS VX.2x Standard Plus | 4.5 Gb download links are provided by Extabit Rapidshare Uploaded Rapidgator Netload Bitshare Freakshare Letitbit Dizzcloud and more.